It has been 4 years, 11 months, and 16 days since I’ve slept in. Sad, but true. I have not seen the other side of 9 am since 2009, when Dillon was born. And Jake? Forget it. He had colic when he was a baby and screamed his head off for 6 weeks straight. So that’s sleep deprivation and tears x2. Over the years, I’ve tried to master their little bedtime schedules thinking that I could defeat their trickery, but I have failed. I have failed miserably. The morning crew is up at 5:30 and that’s it. But 4 years, 11 months, and 16 days later… a miracle happened. 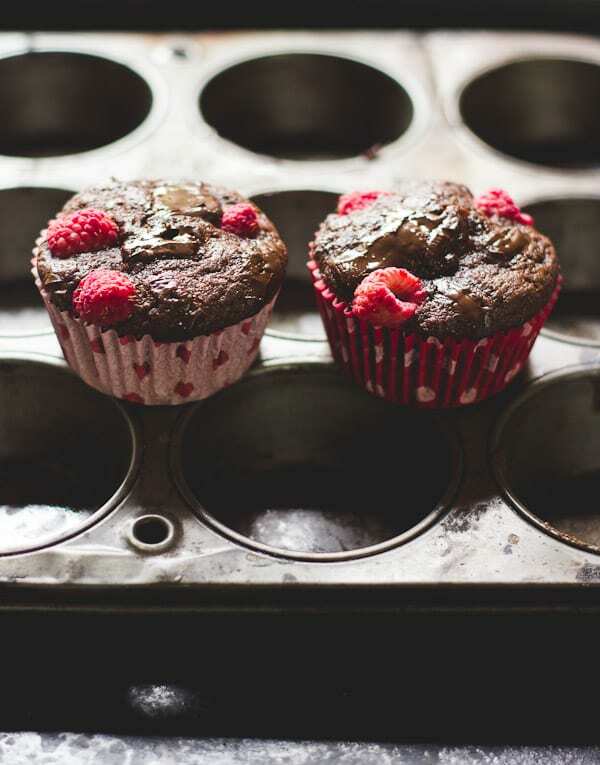 So, these muffins- I’ve always been into raspberry and chocolate together. A couple of years ago, my birthday cake was this incredible fudgy, dark chocolate masterpiece with raspberry-chambord ganache (life changing). 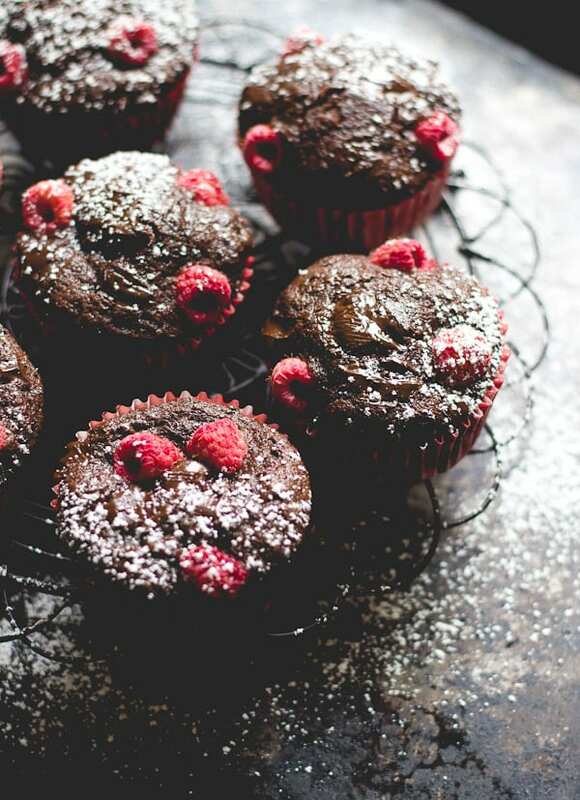 But as much I like this combo, I’ve never had luck baking with raspberries. They are very delicate and fall apart easily. To remedy this, I’ve been using frozen raspberries. Although it doesn’t solve the problem completely, their shape holds up much better. Fresh berries will work too; flash freeze for 15 minutes prior to baking. 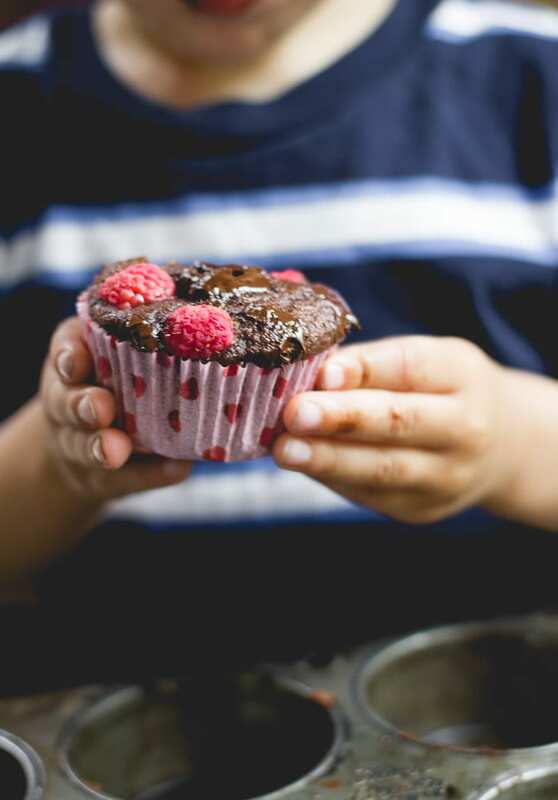 Spelt flour and chocolate also go very well together. I find myself using more and more of it in my baking these days. It is very similar to whole wheat, but has less gluten and is easier to digest. I didn’t go 100% spelt because I wanted the texture to be light, somewhere in between a muffin and a cupcake. We like to make these cookies with any leftover spelt flour. 4 years, 11 months, and 16 days later it finally happened. Good things come to those who wait? I think so. For best flavor, it is worth seeking out a good quality cocoa powder for this recipe. You can taste the difference. Ghirardelli (found in most stores) will yield good results. Don’t skimp on this. Warm brewed coffee replaces water or milk to enhance the chocolate flavor. Decaf will work too. I buy my dark chocolate in bars and chop it myself. You can also substitute with chocolate chips. Preheat your oven to 375 F. Line a muffin tin with 12 paper cases. In another bowl, whisk the wet ingredients until well blended. Combine the dry and wet ingredients; do not over mix. Fold in the dark chocolate, making sure to reserve the rest for garnish. Pour the batter into the the prepared muffin tin about ⅔'s full. 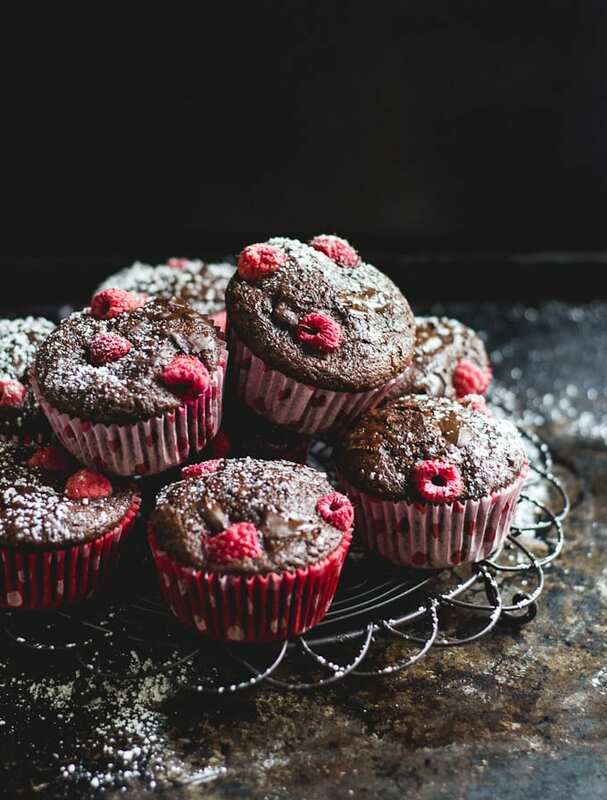 Garnish with frozen raspberries (about 3 per muffin) and the remaining chopped chocolate by gently tucking everything into the batter. Bake for about 20-25 minutes. They are ready when a toothpick comes out clean when inserted. 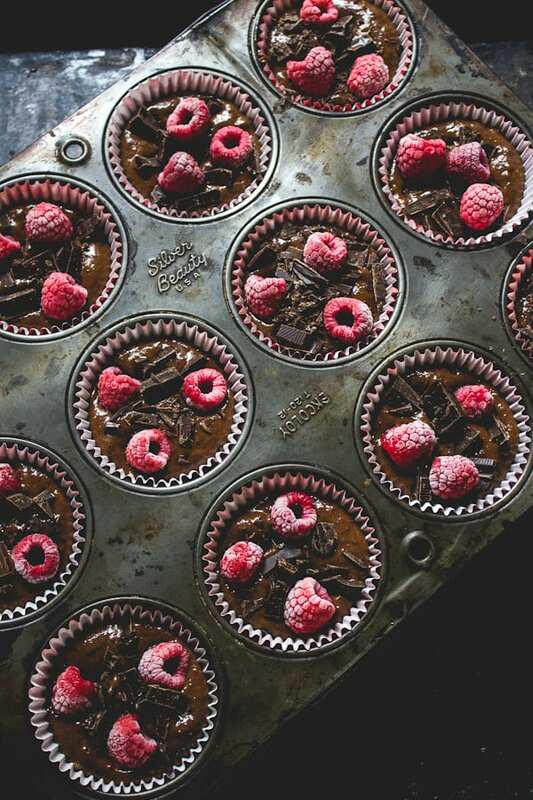 Remove the muffins and let them sit in the pan for about 5 minutes. 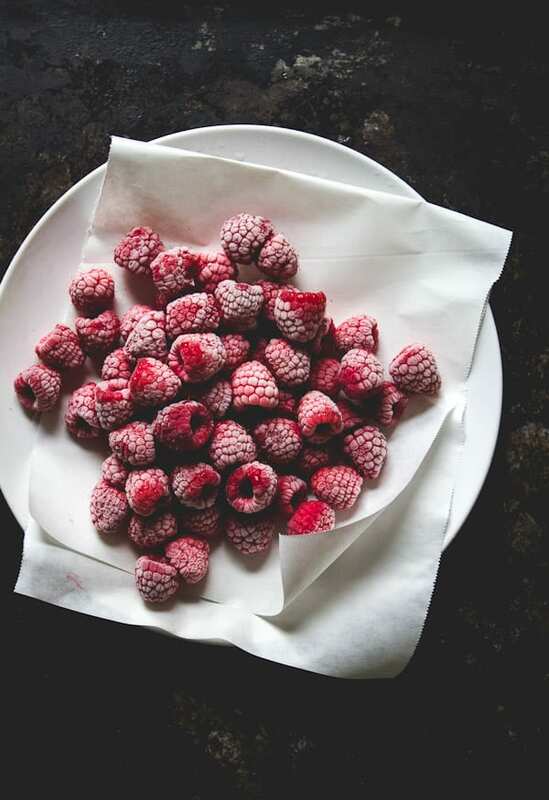 Great tip to use frozen raspberries! I bet that helps them from becoming mush. Congrats on sleeping in! 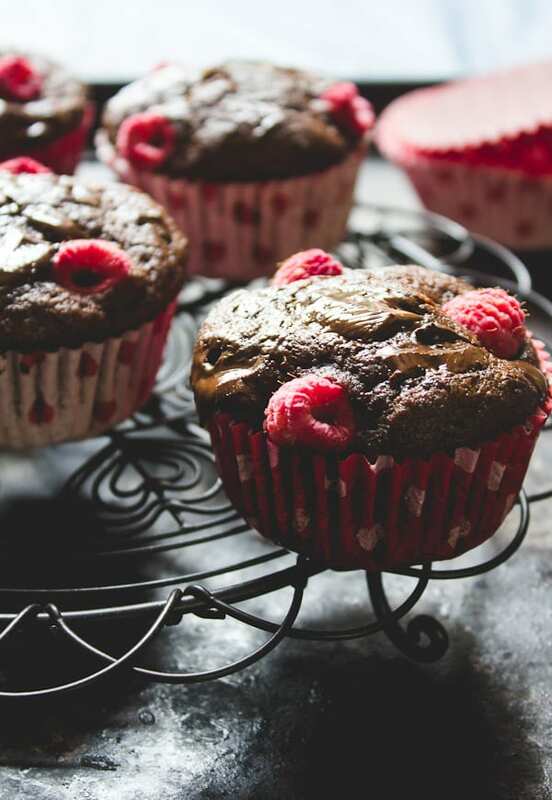 Such pretty muffins, love those chocolate chunks and gorgeous raspberries! How much spelt flour would be used if replacing plain flour to make it gluten free?